The creators behind the Dragonstine: Kingdoms, Meow Match games, has just released a brand new game Dragon Strike Puzzle RPG for mobile. The game combines the base building and match-3 gameplay with character building mechanics. It also features an arena mode in which the players from all over the world fight for the trophies and resources. Additionally, Dragon Strike Puzzle RPG features lots of heroes, dragons. No doubt, it’s easy to understand the game’s mechanics as the tutorial is well-polished, the game system is quite simple, but still, there are a number of things you need to know. And if you are having the problem winning the arena battles, campaign battles, we are here to help you. In today’s post, we have covered everything about the game you need to know as a rookie: Dragon Strike Puzzle RPG guide and Dragon Strike Puzzle RPG tips, cheats & strategy to master the game. Before heading to the tips, cheats & strategy guide, let’s take a look at the basics first. In Dragon Strike Puzzle RPG, your objective is to build the team or party of best characters/heroes/dragons. In the team, you can add up to five heroes. And each hero can lead one dragon in the battle. In short, you can add five heroes, five dragons to the team. Characters added to the team will also defend your base from enemies in the arena mode. In the arena mode, enemies can attack your base and steal the resources(elixir, stone), trophies. To maintain the trophies or rank and protect the resources from being robbed, you have to build the squad of best heroes/dragons. Similarly, you can loot the enemy base in the arena mode. Dragon Strike Puzzle RPG features a simple combat system, but it’s hard to master as there are a number of tactics involved in the battle system. All you do is match the same color tiles to strike the enemy. Tactics or complex things are elemental advantages, buffs, item buffs, hero skills, dragons, and much more. We will go deep into the combat part in the guide section below. There are a number of buildings at your base and all have some importance. Some buildings produce resources while some are used by the player to craft items, summon heroes, in researching, recruiting the heroes, storing the resources. The main resources in Dragon Strike Puzzle RPG are elixir, stone, and coins. Coins are used in recruiting the heroes at tavern facility. Stone, elixir used in upgrading the facilities, in researching, upgrading or promoting the heroes. The main building is the castle. Without upgrading the castle, the player can not level up other buildings. Your job is to improve the production of resources by upgrading the production facilities such as Quarry, Elixir Generator. Additionally, at the workshop, you can craft items. In the university building, you can research or activate bonus effects. Last but not least, Dragon Den facility is another one of the main buildings in Dragon Strike Puzzle RPG. Here you can train the dragons. Both heroes and dragons’ power determine the power of the whole team. As mentioned above, you can assign one dragon to a particular hero. In the battle, dragons attack the enemies when you match 3 or more tiles on the board. The damage dealt by dragons depends on the hero’s power as well as the dragon’s power. And keep in mind that color of the dragon and hero plays an important role. For example; you have a green color hero. So you cannot assign blue/red/yellow color dragon. The color of the hero and dragon should be the same. On the main screen of the game, at the bottom menu, tap the heroes option -> edit party -> there you can customize the party; heroes as well as the dragon. This team will defend the base in the arena mode, so make sure to choose the right heroes. You can obtain heroes from the campaign mode stages, recruit them at the tavern or summon the heroes at the summoning portal. At the top-right corner of the main screen, tap the summon option -> daily summon or hero summon -> confirm. You can use stones to summon for free or spend pink color gems. If you want high-rank or star heroes, then upgrade the tavern or spend gems in the summoning portal. How To Get Dragons In Dragon Strike Puzzle RPG? You can obtain the dragons by summoning in the summoning portal or play the game; campaign battles. As you progress in the game, you will fight against high-rank players in the arena mode, powerful enemies in the campaign mode. So it’s obvious that you will need to increase the power of heroes as well as dragons to give the enemies a tough fight. There are a number of ways to increase the power of heroes and dragons. The best ways are leveling up and promoting. Go to the heroes menu -> select the hero -> level up or promote -> confirm. In the leveling up process, you have to sacrifice some heroes(use low-rank heroes). And in the promoting process, you need resources or materials. You can obtain the materials from the campaign battles. Leveling Up the hero increases all the attribute; attack, defense, and more. And by promoting the hero, you can increase its rank, maximum level. In the heroes menu, at the top-right corner of hero’s icon, you can check the rank(arrow icons). All the heroes in Dragon Strike Puzzle RPG have some special skill. For example; Fionnula is a dark type hero and her skill can heal or restores the health of allies by 25%. The player can increase the skill level by selecting the duplicate characters(as it increases the chances). 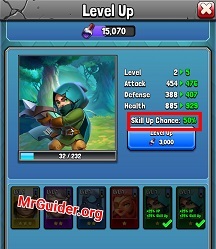 When you level up a hero, just above the level up button, the game will show you the chances of skill up after selecting the heroes. Usually, you have to select the same hero(you can obtain duplicate heroes by recruiting, summoning) in the skill up process. So this is the Dragon Strike Puzzle RPG guide for the beginners. Now, let’s head to the Dragon Strike Puzzle RPG tips, cheats & strategy to master the game. For example; there are five enemies in the battle. Two on the left side, two on the right side, and one in the center. Suppose, you have killed the left two enemies. Now, if you match the tiles on the left side, it would not strike the enemies in the center, right side. But it will surely increase the mana of hero. But in the situation, you have to attack the enemies instead of wasting the turn in filling mana. So make sure to match tiles in the enemy direction. Strong heroes deal double damage to the enemies. Weak heroes deal -50% damage to the enemies. How to check the enemy color? It’s very simple. All you need to do is hold down the enemy in the battle(long press the enemy to get details). Some enemies, as well as heroes, have healing skill. Using it, they can heal team members. If the enemy team has a healer(long press the enemy to check its skill), then make sure to defeat it as soon as possible. The reason is they will make it hard for you to win the battle when fighting against the same level team. As stated above, each hero has their own unique skill. In the heroes menu, tap the hero and you can check the hero skill. To use the hero skill in the battle, you must provide mana power to that hero. 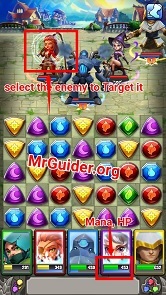 Mana can be obtained by matching the same color tiles. For example; to charge the red color hero skill, match the red tiles. Once charged, tap the hero icon to unleash the skill. Make sure to use the skills at the right time and charge often by matching the tiles. (Mana Bar – Bottom of the hero’s icon in the battle). At your base, head to the university and there you can unlock special boosts for the heroes. You can choose up to five items for the battle. And efficiently using the items in the battle can lead you to the victory. So make sure to craft the items in the workshop. Upgrade the workshop to unlock more powerful items. In the heroes menu, tap the items button to select the items. You can earn rich quality rewards from the campaign mode. For example; material for promoting the heroes, crafting the items. If you want more coins, items or material, make sure to repeat the stages. Make sure to upgrade the resource generators to increase the production, upgrade the tavern to get high-rank heroes, the workshop to craft more items, university to unlock new bonuses. You can summon for free daily. And in the store menu, make sure to collect the merchant gift. From the arena building at your base, you can collect the resources after every certain amount of time.